Fox17online.com is reporting on the unexpected resistance coming from the residents of Newaygo, a rural town in West Michigan, where a display featuring the three wise men and the Star of David are traditionally mounted on the top of the public school. However, Mitch Kahle, a member of the Michigan Association of Civil Rights Activists (MACRA) claims his group received a complaint along with photos of the display from an area resident. “We’ve asked the school to remove what is, in essence, a nativity scene from the top of the school and from school property. If this were on private property this wouldn’t be an issue,” Kahle told FOX 17. His group wrote a letter to Newaygo Public School superintendent Peg Thelen Mathis who responded by saying that they are working with attorneys to formulate an appropriate response and that the school is in no way seeking to either advance or inhibit religion. She also posted a public letter on her Facebook page in which she compared the display to other purposeful traditions of the school. “Newaygo Public Schools has a legitimate secular purpose for the display,” she wrote. “We are both upholding the community’s tradition of celebrating a public holiday and attempting to point towards the importance of wisdom, knowledge, and open-mindedness. They’ve been described as the scientists of their time. 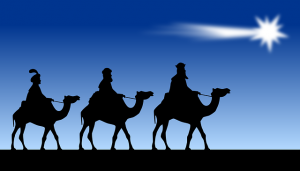 The ‘wise men’ are found in secular and other religious traditions outside of Christianity. Finally, there is no evidence that they were Jewish or Christian before their travels and there is nothing noted in the Christian Bible to indicate anything about any religion they practiced after their travels”. Judging by the comments from the residents, which are largely in support of the display, MACRA may have a problem on its hands. Newaygo resident Sandy Emmerick told FOX 17 that she enjoys looking at the display from the window of her antique shop. “I personally don’t judge. This is their opinion. This is my opinion. I’m a Christian and this is our little town in Newaygo, and we enjoy it,” she said.